Crusader Rabbit came out twice. First in 1950. 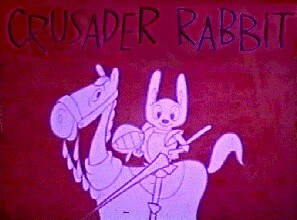 Crusader Rabbit was voiced by Lucille Bliss. Ragland T. Tiger was Vern Louden and the narrator was Roy Whaley. Produced by Jay Ward Productions. It went off the air in 1952. It came back on in 1957 with GeGe Pearson as Crusader Rabbit. Rags and the narrator were the same actors as before. But the production company had changed: Creston Studios. The second series went off the air in 13 weeks. GeGe Pearson struggled as a voice actress and retired in 1965. She died in 1975 at the age of 58. This is tv's very first cartoon series. I first watched the 1957 version of "Crusader Rabbit" on "Children's Theater" with Ray Forrest Saturday mornings on WNBC TV Ch.4 in NYC. This was a predecessor to Bullwinkle. I recall one episode in which our heroes found themselves on an island named Nothing Atoll.